Graham, 72, who worked at Westover Veterinary Centre in Norfolk for 40 years, set off on his bike from his home in Crostwick last week (4 June). Graham, who is a trustee of AWF, aims to complete his journey in two years, following a route that will take him through Western Europe and into Greece before flying to Ethiopia and cycling through Kenya, where Graham spent eight years as a government veterinary officer in his early career. He will then follow the Indian Ocean down the African continent's east coast to Cape Town. Graham is raising money for AWF, a charity set up by a group of vets just over 30 years ago to improve the welfare of animals. Today the charity funds research, supports veterinary education, provides pet care advice and encourages veterinary and public debate on animal welfare issues. 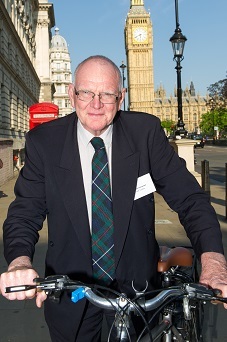 Graham cycled via London to join the annual AWF Discussion Forum in Westminster, attended by other vets, parliamentarians and key stakeholders from the sector, before continuing his cycle to the English south coast with TV vet Emma Milne. Along the way Graham will also be working with equine charitable organisations including the Brooke, SPANA and World Horse Welfare, giving equine welfare and dentistry talks, as well as occasionally returning to the UK to lecture and attend AWF Trustee meetings. If you would like to sponsor Graham and donate to AWF, or simply find out more about his trip through his regular blog posts, please visit vetduncdares.wordpress.com.